Klin, Moscow State, Russia - 31 August 2018. The State Memorial Musical Museum of P.I. Tchaikovsky in Klin. 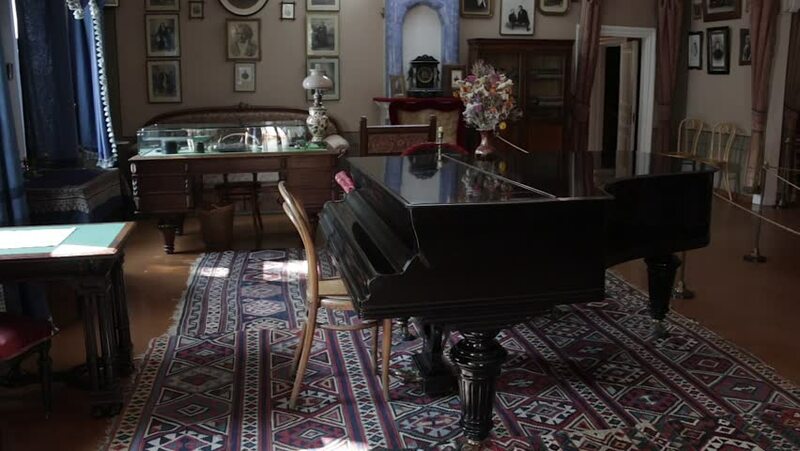 Salon of Tchaikovsky house, with his grand piano and desk. hd00:12Klin, Moscow State, Russia - 31 August 2018. The State Memorial Musical Museum of P.I. Tchaikovsky in Klin. Salon of Tchaikovsky house, with his grand piano and desk. sd00:481960s: A spacecraft Is tested in a high altitude chamber at the McDonald Aircraft Company in 1961.
sd00:511960s: Radar equipment is tested for a spacecraft in 1961.
hd00:08TOKYO, JAPAN - JANUARY 29, 2017: Tokyo Local Street Shop Selling Nuts and food. 4k00:11Musicians recording keyboards in boutique recording studio. hd00:36London - Circa 2014: A huge crowd of commuters make their way down the street on their way to work in the City of London. 4k00:05Timelapse of Times Square, New York, USA. In 4K.